Bishop Charles E. Poole and Evangelist Mattie Poole, Brother Louis Howard Jackson was baptized in Jesus’ name and received the Holy Ghost. He served faithfully at Bethlehem Healing Temple, where he met and married his faithful wife, Evangelist Mildred Jackson in 1974. 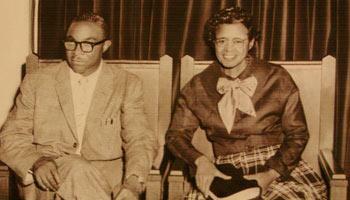 Also in 1974, Brother Louis Jackson, in continuing on the journey, became a minister of the Gospel. Three years later, in 1977, Bishop Poole, seeing the leadership qualities in Elder Jackson, presented him a daunting challenge. The church in Atlanta needed a shepherd and as Moses was sent to Egypt, so Elder Jackson was sent to Atlanta, Georgia. So began the endurance test for the new pastor and his family at Bethlehem Healing Temple Church, Inc as it was called then. Elder Louis Jackson was a determined leader who labored with his hands and labored spiritually to rebuild the congregation. It was not easy at times. Yet he persisted. Resources were meager and encouraging support from the congregation at times questionable. In spite of many obstacles, with the help of God the church continues to slowly strengthen. Later the name of the church was changed to the Atlanta Healing Temple Church, Inc.
Elder Jackson and his family were humble people. With help from God his ministry took on another dimension as he began to travel and encourage other pastors and ministers. He worked tirelessly to achieve another milestone when he was appointed District Elder. He continued to build fellowship and steadily strengthen his congregation. After the death of Bishop Poole, District Elder Jackson was ordained Bishop under the auspices of the Fellowship Alliance of the Apostolic Faith. He served alongside its founder, the late Bishop Luther C. Anderson of Savannah, Georgia. Moving further in the journey, Bishop Jackson accepted the role of helping to build a new Apostolic fellowship, Helping Hand Churches, Inc. Founded by his brother, Presiding Bishop Scottie Jackson, Bishop Louis Jackson served as Assistant Presiding Bishop for over 10 years. Through the years Bishop Jackson has progressively lead Atlanta Healing Temple through its storms and victories. Being a man of faith and vision earned our pastor the respect of many across the country and in Atlanta. There were some who didn’t think we would be here today. For years Bishop put God’s work ahead of personal ambition and his love of God’s people has not gone unrewarded. Bishops’ soul was not content with our old house of worship on Hank Aaron Drive. God’s anointing was there, but the building was in disrepair. It seemed time and fate were against us as we engaged builders and architects, even losing some of our money. Still Bishop Jackson gave us all hope. Finally the waiting was about to end with a miracle only God could have ordained. On a sunny Sunday morning, October 19, 2008, the congregation took one last walk though the old temple, some tearfully. Finally, with Bishop Jackson and his family in a limousine, two motorcycle patrolmen lead a long motorcade from Hank Aaron Drive to our new home on Holcomb Avenue in East Point, Georgia. Inside, once we finally stopped shouting long enough, Bishop Jackson, our faithful “Moses”, gave his first sermon in the new temple, preaching from John 3:1-3. Shortly thereafter, Georgia’s Secretary of State officially approved the congregation’s request to change our name to Greater Atlanta Healing Temple, Inc. Today, 37 years later, you too can share in our glorious journey as we serve the East Point community. Come aboard! We invite you to join us. We welcome each of you! The journey isn’t over yet.